Jeff and Jenny Gross present members of the CHOC Foundation and CHOC’s neonatal intensive care unit with a $5 million donation. CHOC Children’s today announced a $5 million gift from the William, Jeff and Jennifer Gross Family Foundation to expand its Small Baby Unit (SBU) on its main hospital campus. Opened in 2010, the SBU focuses on caring for the unique needs of the smallest and sickest babies. Designed for infants born at less than 28 weeks gestation or weighing less than 1,000 grams, it is the only unit of its kind anywhere. 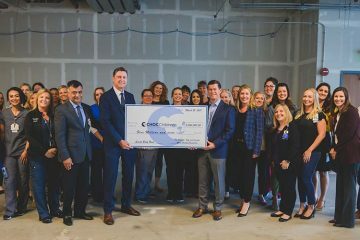 “We’re thrilled to support CHOC Children’s and their efforts to improve care for the tiniest, most fragile newborns in our region through the expansion of their Small Baby Unit. CHOC changes many lives every day and is truly a world class children’s hospital. We’re honored to be a part of it,” says Jeff Gross. Reduction in chronic lung disease from 47.5 percent to 35.4 percent. A common condition for premature babies, chronic lung disease can have long-lasting ramifications including re-hospitalization and poor neurodevelopment. Rate of hospital-acquired infection decreased from 39.3 percent to 19.4 percent. Reduction in laboratory tests (from 224 to 82) and X-rays (from 45 to 22).